In food processor, process pretzels until coarsely chopped. Remove 1/2 cup chopped pretzels; set aside. Process remaining pretzels until finely crushed (about 1 cup). Spread both cans of strawberry pie filling in pan. In medium bowl, stir dry cake mix, melted butter and finely crushed pretzels until combined. Sprinkle cake mixture on top of strawberry pie filling in pan. Bake 30 to 35 minutes or until pie filling bubbles and cake mixture is lightly golden. Cool completely on cooling rack, about 2 hours. In large bowl, beat cream cheese and sugar with electric mixer on medium speed about 1 minute or until smooth. Fold in whipped topping until thoroughly combined. Spread mixture over top of cooled cake. Sprinkle reserved chopped pretzels on top just before serving. Swap white cake mix with Betty Crocker™ Super Moist™ yellow cake mix, if desired. Strawberry pretzel salad is the star of the summer potluck season and it’s no secret why: a crunchy salty layer comes together with a sweet strawberry filling and whipped topping, and the rest is history. It’s said that the recipe was originally published in a cookbook called The Joys of Jell-O™ which makes sense considering the traditional recipe calls for strawberry gelatin. 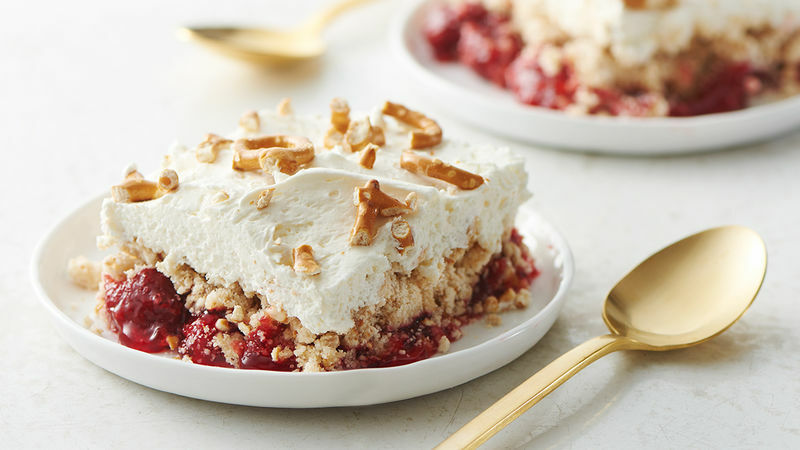 It’s hard to improve on this nostalgic dessert, but we’ve achieved the impossible with this dump cake that takes everything we love about strawberry pretzel salad and turns it into a decadent cake that we’d make on the regular for potlucks, parties and even on weeknights! Speaking of cake, it’s about time you learn how to bake a cake from scratch. Start here.